New York - From March 26 through March 28, a Lenten Retreat and Pastoral Conference for clergy of the Eastern American Diocese was held at St. John the Baptist Cathedral in Washington, DC. 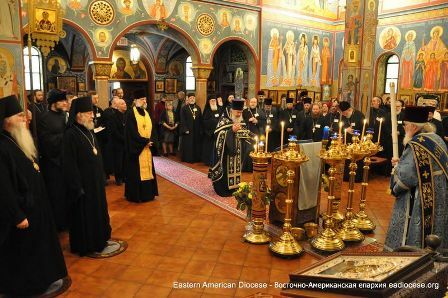 The goal of the conferences, which have been held annually for many years, is, in the words of Metropolitan Hilarion, "the fortification and renewal of that internal strength, unto the continuation of your labors in Christ's Holy Church." Conference participants took part in spiritual discussions, concelebrated at church services, confessed and communed, and shared their thoughts with fellow clergy. Participating in the conference were two bishops and 96 clergymen (priests and deacons) and spouses. In a short sermon to the participants, Bishop Jerome highlighted the importance of holding these diocesan conferences, where clergy and the faithful can acquaint themselves with the history of and positions held by ROCOR, which facilitates the return to the bosom of the Church of those who separated from Her after the Reunification of the Churches in 2007. Additionally, the conference allows the clergy to share their experiences, which leads to greater mutual understanding and the strengthening of unity within the diocese. Finally, interaction between the clergy helps to avoid making serious liturgical errors, which clergymen can begin to incorporate as a result of longterm isolation in their churches, away from other clerics. Taking into account the important of such events, the Fund for Assistance to ROCOR paid the registration fees for nine priests, who otherwise would not have been able to participate in the conference.